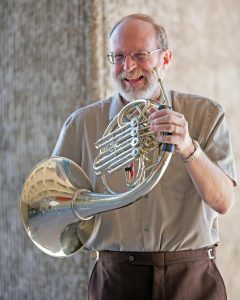 STEVEN GROSS is Professor of Horn and Director of the Wind, Brass, and Percussion Program at the University of California–Santa Barbara. Dr. Gross is also a former member of the Atlanta Symphony, National Symphony, Santa Fe Opera Orchestra, and for 24 years Principal horn of the Cincinnati Chamber Orchestra. His international solo appearances include Austria, Russia, Czech Republic, Switzerland, South Africa, England, Kenya, China and Taiwan. In the United States, he has presented concerts and masterclasses at the Eastman School, Peabody and Oberlin Conservatories, and Indiana, Southern Methodist, Baylor, and Temple Universities, among others. His summers include performing as principal horn of the Oregon Coast Music Festival Orchestra, and as horn faculty at the Crescendo Summer Institute in Tokaj, Hungary, as well as Hornclass 2018 in Prague. At the age of 21, Steven Gross won the First International Heldenleben Horn Competition. He is now Director of the International Horn Competition of America, North America’s leading solo event for horn.